South Korea will host a round of Blancpain GT Series Asia for the first time next season following confirmation of the championship’s 2019 calendar during SRO Motorsports Group’s annual press conference at the Total 24 Hours of Spa. The schedule once again features 12 one-hour races spread across six events, with the now familiar FIA Grade 1 destinations of Sepang (Malaysia), Buriram (Thailand), Suzuka (Japan), Fuji (Japan) and Shanghai (China) joined on the list by Yeongam’s ex-Formula 1 venue. Indeed, following two successful campaigns staged across the breadth of Asia, organisers felt the time was right to visit another of the continent’s emerging motorsport markets. Korea’s automotive industry is already well established internationally, which is also having a positive impact on the country’s growing domestic motorsport scene. That was highlighted by Indigo Racing’s 2018 Blancpain GT Series Asia entry – the first by a Korean team abroad – and it’s anticipated the championship’s visit to Yeongam will help generate further interest amongst local teams and drivers. Yeongam – or the Korea International Circuit as it’s officially known – is located near the port city of Mokpo on the south-western tip of the Korean peninsula. The 18-turn, 5.615km circuit was completed in 2010 and staged the first of its four Formula 1 Grands Prix that same year. 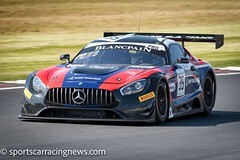 As ever Blancpain GT Series Asia’s season begins at Sepang on April 6/7, albeit with official testing scheduled for the days leading up to the event. Cars and equipment are then shipped to Buriram in time for May 11/12 when organisers hope to welcome another passionate 20,000-strong crowd similar to the one that descended on the circuit earlier this year. Suzuka and Fuji take place two weeks apart on June 22/23 and July 6/7, respectively, before Yeongam then hosts its inaugural Blancpain GT Series Asia event one month later on August 3/4. Shanghai closes out the campaign on a soon-to-be-confirmed weekend in September. Changes to both class formats have also been confirmed. In GT3, the presence of one Asian national or resident per Pro/Am and Silver Cup entry will become mandatory from 2019, while GT4’s all-amateur category has now been reserved for Asian and Oceanic nationals and residents. The classes have also been split, meaning separate GT3 and GT4 races will take place over the same weekend. SRO’s work in Asia also extends to the continent’s only Intercontinental GT Challenge round, the Suzuka 10 Hours, which takes place on August 24/25. It’s hoped several Blancpain GT Series Asia teams will take the opportunity to compete at this significant event, which features the same Pirelli tyres and SRO BoP as used throughout the regular season. Work is also continuing to establish a bigger and better support package, which will combine a consistent list of high-profile continental championships with the usual array of national categories. Lamborghini Super Trofeo Asia has been confirmed for a third season while the new F3 Asian Championship, which staged its inaugural round earlier this month, also joins the roster of regular support series. « ADAC GT MASTERS AT THE NURBURGRING: WHO WILL BE CROWNED ‘CHAMPION’ AT MID-POINT IN SEASON?